Face peels can offer many anti aging benefits to improve the complexion and correct imperfections. There is a vast range of types to choose from, designed to treat many specific conditions. Treatments can be very useful to help eliminate sun damage by removing dark pigmentation and rough texture. They help restore complexions to a brighter more even-colour. Chemical peel treatments are very often included in acne control to help remove excess sebum, rough damaged cells, and improve scar tissue. Peels are generally used for the face but can also be used to improve other areas of the body for various problems and specific needs. Many different brands and chemicals are used in peel treatments including Glycolic peel, Betahydroxy, Trichloroacetic (TCA), Salicylic acid (BHA), “Jessners” solution, Obagi blue peel, and Phenol. The different chemical solutions produce different degree depths of controlled injury to the outermost layers of the skin. Damaged layers gently peel off revealing the improved, smooth, new complexion. Results vary- depending on what peel and concentration used. Stronger, deeper penetration peels will produce a more dramatic and longer lasting result but require more “down time” for healing and recovery and they are a higher risk. Alpha-hydroxy (AHAs) – Superficial “Lunch time peel” such as Glycolic, Lactic or fruit peels are the mildest types that treat fine wrinkling and lines, facial acne, rough, dry complexions, and improve mild photoaging. This type of peel is considered to be a very light, non aggressive peel with reduced peeling and more flaking of the skin and is a popular home chemical peel treatment. These rejuvenation peels can be applied weekly or spaced out at longer intervals to obtain the best result. Repetitive peels may be needed to obtain the desired result. AHAs are ideal for people who do not have time for a long recovery period. 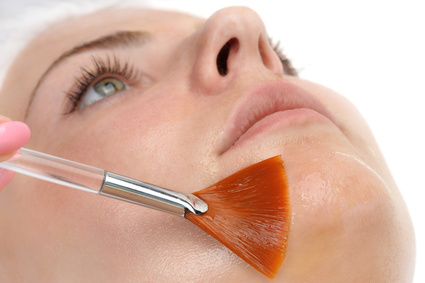 TCA is most commonly used as a medium depth peel for rejuvenation and correcting flaws. Treatments offer the following advantages. The results are “priceless,” however recovery time can last up to 2 weeks or more. Always protect your face and body from sun damage – remember your daily use of sunscreen. Deep Phenol Peel – Phenol acid is the strongest chemical peel solution and used for deep penetration. Deeper peels can be a very complicated procedure and should only be performed by an experienced surgeon. This professional peel treatment offers many antiaging solutions and is often used as an acne scar treatment to treat very severe facial acne scars. A single treatment can also help correct a heavily wrinkled complexion, deep lines, birthmarks, and pre-cancerous growths. Recovery can take several weeks. Effects can last for 10 years or more. Before undergoing treatment face peels for the first time do some research to ensure that you understand the type, purchase the correct one for your personal situation, and will be satisfied with the outcome of your treatment.